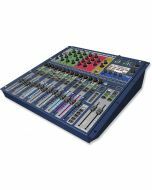 The Ui Series mixers feature cross-platform compatibility with iOS, Android, Windows, Mac OS, and Linux devices, and can host up to 10 control devices simultaneously. Featuring built-in HARMAN signal processing from dbx, DigiTech and Lexicon, including dbx AFS2, DigiTech Amp Modeling, and more. 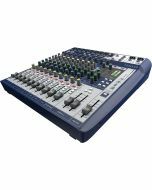 All models feature fully recallable and remote-controlled mic gain and phantom power, along with 4-band parametric EQ, high-pass filter, compressor, de-esser and noise gate on input channels. DSP features include 31-band graphic EQ, noise gate and compressor on all outputs, plus real-time frequency analyser (RTA) on inputs and outputs. Built in are three dedicated Lexicon FX busses: Reverb, Delay and Chorus. In addition, mixer controls include Subgroups, Mute groups and View groups, among others. The Ui Series mixers feature full Show/Snapshot recallability with channel recall safes. while security lockout features allow customization of device access to only specific functions and mixes if needed. All mixers also offer independent network interfaces on board for simultaneous control by Wi-Fi and Ethernet, plus a floor-ready rugged chassis for live applications.